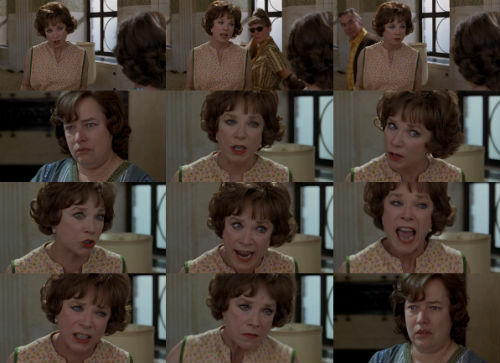 Pearl Berman: You want me to say that everything is my fault. I’m not gonna do it. You think I was mean to you when you were a kid? You think I didn’t do enough for you? Well, I’m sorry, but I had a couple of other things on my mind, you know? Like a Depression, a war, and your father – God bless him – sleepwalking through your whole childhood. God forbid I should know myself the way you know yourself, that I should ask myself those questions. Like what happened to my life? Did I deserve more? Did I ever for one second get as much as I gave? God forbid I should ask those questions, because if I looked inside myself and I really saw what I shut out my whole life, what I really missed, there’d come from out of me such a rage it would blow this building apart, and it would blow you into a million little pieces and it would blow Queens off of the face of the goddamned map! Posted on June 25, 2014, in Movie Quote of the Day and tagged 1992, Beeban Kidron, Kathy Bates, Shirley MacLaine, Todd Graff, Used People. Bookmark the permalink. 2 Comments.